Well with the latest snow in the east as well as all over the country is anyone else just sick of this winter. We still have 4 feet of snow in the yard and just 2 days ago we were -20 below again. We have had snow since mid Oct. Being 55 and living up here all my life I've seen a lot of winters but for some reason this has been a loooooong winter. How are you guy taking is season? I'm with you!! Heating season started a month early and no sign of spring yet! HAHAHAHA!!!!!!!!!!!!!! 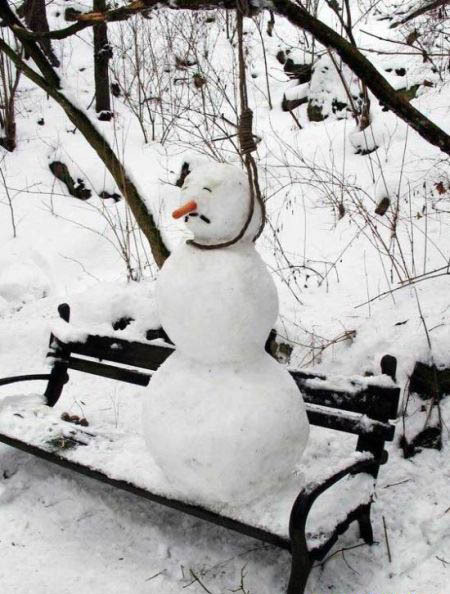 I just about spit my drink out from that poor snowman!!!!!!!!!! Out here in Idaho we deal with it. Of course we have mountains to snowmobile in to keep us happy. My dad and I took our new Kawasaki Concours out to pick up a ski runner for my snowmobile. we had a high of about 45 and today is about the same. Nice and warm here for winter actually. Michigan has enjoyed an useasonably mild winter. Even in out heaviest years we pale in comparison to Idaho and ND...You guys are strong willed....maybe on the verge of nutty...eh? At least in my case I think the latter applies! Not quite nutty, we prefer the term.... bold. But we've had a sissy winter this year. Frankly i'm peeved. I've been on only 3 good snowmobile rides this year. By this time of year i should usually have about 10 under my belt. Hopefully the snow is good in the foothills this Saturday. Who knows we might head up to the mountains for some deep stuff. We usually have anywhere from 3-5 feet of snow up in the mountains (west yellowstone-ish area if anyone cares) But this year it's been sad to say the least. We have 33 inches according to the NWCC website up there. I've had years where I sink to my chest in snow and have to use brute arm strength to get back onto my snowmobile. I've grown up having TRUE winters. Where school shuts down only if it's -25 or the snow plows can't get out. And i think i've had about 2 times where the latter happens. But about once a year they cancel school for the cold. If we can't start buses, then school doesn't open, other than that, it's not much that can stop us. http://s232.photobucket.com/albums/e...4Sledding6.jpg my brother in the yellow is about 6 foot to give you an idea. This picture was taken back in '06 so I've grown about a foot since then I'm not that short anymore. winter storage: what proceedures should i take?